Seven years after he paddled 4,225 miles down the Amazon River, where he encountered pink dolphins, swirling rapids and floating bales of marijuana, West Hansen is gearing up to lead the first expedition to kayak the Northwest Passage. 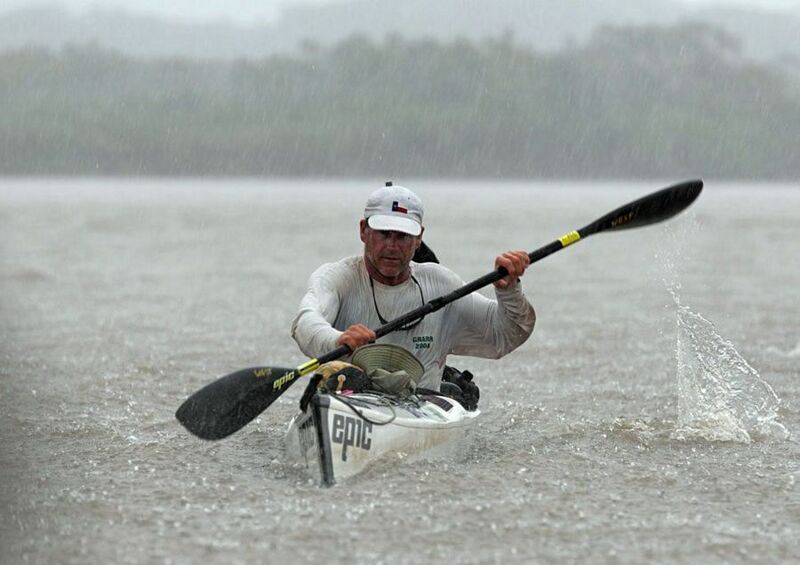 Hansen, a 56-year-old social worker from Austin, Texas, led a National Geographic-sponsored team that made the longest source-to-sea paddling descent of the Amazon River in 2012. Two years later he led the first descent of the Volga River in Russia. He also holds speed records in the grueling Texas Water Safari, a 260-mile canoe race from Central Texas to the Gulf of Mexico, and the Missouri River 340. Now he and the rest of the Arctic Cowboys are aiming farther north. Launching this summer, Hansen, along with veteran paddlers Jeff Wueste, 58, and Jimmy Harvey, 56, will cover roughly 1,900 miles, half of which have never been kayaked. Their Arctic expedition will follow the same east-to-west route that explorer Roald Amundsen took during his landmark three-year navigation of the passage, completed in 1906, starting in Baffin Bay and finishing at the Beaufort Sea. The sun will never completely set, and the paddlers will face gale force winds, crushing sea ice and pummeling waves, plus orcas and polar bears. The explorers will aim to paddle about 50 miles a day through the stark, frozen terrain. With 20 days factored in as a buffer in case of poor conditions, they expect to finish in about 60 days. The expedition is expected to cost nearly $75,000. They’ll face plenty of challenges along the way. Polar bears, described as “hyper carnivorous,” come equipped with 42 teeth and can smell a seal from a mile away, or 3 feet beneath the ice. The bears are agile, too, clocking speeds of up to 6 mph in the water for hundreds of miles at a stretch, and up to 25 mph in short bursts on land. And yes, they’ve been known to stalk and attack humans. Experts say the expedition will certainly cross paths with the bears, which are classified as a “vulnerable species” because of habitat loss due to melting sea ice. “If they are only in a kayak, there is risk they may be followed by bears and (are) at greater risk in small camp,” says Michael Geske of Arctic Kingdom, which leads guided tours to see polar bears in the Arctic. That doesn’t seem to bother Hansen, known for his peak-bagger attitude and scrappy, get-it-done ambition. (He’s faced long odds before; in 2018 he ran unsuccessfully for U.S. Congress.) His team will carry firearms and screaming flares to ward off the 1,500-pound predators, plus satellite phones and beacons for emergencies. They’ll also post sentinels in camp. “You can’t fire a gun (to spook polar bears) because it sounds like cracking ice and polar bears are used to that,” Hansen says. Most of the time, the paddlers will stay within a few miles of shore, but they will face one 45-mile crossing. They also must navigate the treacherous 17-mile Bellot Straight, a narrow, cliff-lined channel with complex currents that is frequented by polar bears. They’ll load camping gear, food and water into kayaks and wind their way through Volkswagen-sized chunks of sea ice when they can, or crawl over it for short distances, dragging their boats, which will weigh about 100 pounds fully loaded. The team will eat mainly dehydrated meals, plus calorie-dense, no-cook items like salami and cheese. Fog and storms will likely complicate the journey, as will water temperatures that at times will hover in the hypothermia-inducing mid-30s. “It’s treacherous in a different way (than the other expeditions),” Hansen says. Their success will depend in part on ice conditions. In 2017, the passage opened completely; in 2018 it never did. That’s why the team is starting in the northeast - the area where the sea ice melts last. If they can get through that section, Hansen says, their chances of completing the expedition improve. Hansen tentatively plans to measure microplastics, monitor sea ice or gather data for jellyfish or plankton studies, whose populations can indicate climate change, during his expedition. He points out that an expedition such as his is only possible because of declining sea ice. It’s also about accomplishing something that no one else has ever done. “I don’t do it to say, ‘Look at me,’ I do it for the newness of the experience, to feel something that no one else has ever experienced,” Hansen says. Wueste, another of the Arctic Cowboys, paddled the Amazon and Volga Rivers with Hansen and has 20 years of ultra marathon canoe racing experience to his name. He says this expedition will be the most challenging yet because of the ice, wind and polar bears. As for those polar bears? Pam LeBlanc is an Austin-based writer who specializes in fitness, adventure and travel writing. She will join the Arctic Cowboys expedition as an embedded journalist.